Project manager Bill O'Malley, foreground, and board member Phil Hall, both with the Friends of Tucson's Birthplace, place ocotillo fencing on top of a ramada in the Mission Gardens, which is at the base of "A" Mountain. Phil Hall arranges the ocotillo fencing on top of the ramada. Some of the pomegranate and fig trees and other plants are visible in the background. At a recent Rio Nuevo meeting, longtime west-side activist Josefina Cardenas suggested bringing in a medicine man to cure our redevelopment ills. And why not? At this point, what do we have to lose? Given the downtown redevelopment entity's history, a little spiritual healing may be in order. Rio Nuevo was supposed to revitalize Tucson's birthplace along the banks of the Santa Cruz, but city leaders ditched honoring our history for grander visions. Ever since, it's as if Rio Nuevo has been cursed. 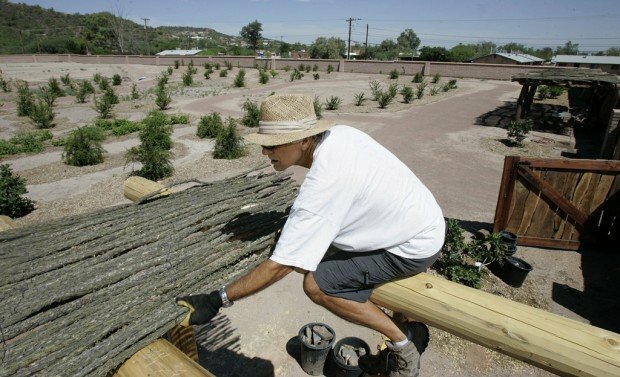 But if a medicine man is too out there for the business leaders now on Rio Nuevo's board, here's another suggestion to lift the curse: Find a way to see the Mission Gardens project through. No hocus pocus here. Unlike so many other concepts Rio Nuevo has failed to deliver, despite spending $230 million, the Mission Gardens project was in the original Rio Nuevo plan voters approved in 1999. But it languished at the base of "A" Mountain for years. Rio Nuevo managed to put up a 6-foot adobe wall at the Mission Gardens site a few years ago, but when the state mandated a new focus on a downtown hotel and convention center, the work ground to a halt. Nothing was planted in the garden, and the wall became a canvas for gang graffiti - "Crip Killas" one memorable tag read. Enter the Friends of Tucson's Birthplace, a group of volunteers committed to our origins. They have rescued Mission Gardens, planting 119 trees and 24 grapevines. 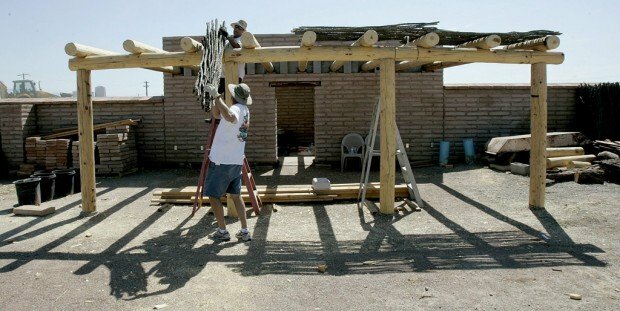 They've installed irrigation, cleaned up the tagging and built traditional ramadas. The group has raised about $175,000 and is committed to finishing what Rio Nuevo failed to start. That means not just Mission Gardens, but also the Mission San Agustín and Convento. Small steps for such big dreams? Yes. But it's something to build from. "This is the core of our history," Diana Hadley, a board member with Friends of Tucson's Birthplace, told me. "This is the whole reason that any of us are here. This could be one of the best revenue-generating projects that we could have in Tucson." I went down to the four-acre Mission Gardens two weeks ago to check things out. There, I caught up with a small and upbeat crew finishing up some work on a Spanish-style ramada (this involved big, peeled logs). "A" Mountain loomed above us, and there was a stunning view across the valley of the Catalinas. Water once flowed in the river. It was clear why people settled in this spot. "This will become a place that people can view from "A" Mountain," Roger Pfeuffer, the former Tucson Unified School District superintendent, told me. "They can take the streetcar across the bridge and walk to this place." If this comment reflected the group's optimism, the orchard reflected their care. It is more than just a replica of the orchard in the original Mission Gardens in the late 1700s and early 1800s. Each pomegranate, quince, fig and apricot tree is a descendant of the plants Father Eusebio Kino and other jesuits brought to the region. They have been reproduced by cuttings, which means they are clones of trees that date back centuries. "They are definitely descendants," Jesús García, an ecologist with the Arizona-Sonora Desert Museum, would later tell me. Garcia has been scouring Arizona, Northern Mexico and Southern Spain looking for these trees. They are living history, and the research is based on the accounts from Kino, the 49ers and others. "We are talking about, really, Islamic ways of agriculture that are still alive in Southern Arizona," he said. So that's the dream: to bring it all back and honor Tucson's birthplace through the story of agriculture on the river. But here's the reality: It will cost potentially another $1 million just to finish Mission Gardens (it could be less). And Rio Nuevo is mandated to first focus on a hotel and the Tucson Convention Center. The museums that were supposed to be built around Mission Gardens will likely never happen - and who knows what will one day be built in their places. "It's Tucson's origins. It's shameful that we don't have a plan to maintain that," Rio Nuevo's new chairman, Fletcher McCusker, told me. He was striking a balancing act. The pressure on the new board is to somehow pursue a hotel and convention center while honoring what he called the "spirit" of the original Rio Nuevo plan. McCusker mentioned possible corporate matches to help fund the cultural projects left behind. But "the TCC is priority number one," he said. "And there probably is a way of partnering with somebody that surrounds the TCC, so we could reissue the notice to proceed on the hotel." He was being honest and realistic about the bind Rio Nuevo is in. Mission Gardens - and all it represents - still has to take a backseat. But why can't dreams become reality? If McCusker can be the pragmatic leader Rio Nuevo needs, maybe he can also be the medicine man for Tucson's origins.